Lisa M. Mills is one of the founding shareholders of Fitzsimmons & Mills, P.C. Lisa’s practice is primarily focused upon matrimonial and family court matters including litigation, mediation and collaborative divorce. 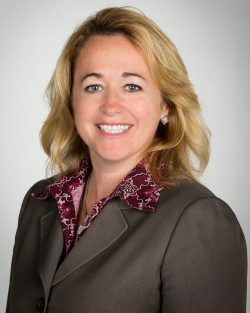 In her litigation practice, Lisa handles a wide range of complex matters including trial counsel in divorce litigation matters, prenuptial agreements, contested and uncontested divorces, child and spousal support proceedings, separation agreements, qualified domestic relations orders and adoptions. Lisa is a trained divorce mediator and assists clients with alternative dispute resolution through mediation. Lisa is also a trained collaborative divorce practitioner, and she is one of the first attorneys to offer this new non-adversarial approach to divorce in Columbia County. Collaborative divorce is also an alternative dispute resolution process in which the divorcing participants commit to resolve their differences through negotiation without Court intervention. In July, 2008, Lisa was selected by the Presiding Justice of the Appellate Division, Third Department to be a member of the Committee on Professional Standards, a panel which oversees Attorney disciplinary matters. In May, 2010, Lisa was appointed to the executive committee of the Committee on Professional Standards. Lisa served on the Committee on Professional Standards from July, 2008 through March, 2015. Additionally, she served as the Third Department law guardian liaison for Columbia County from 2007 through 2012. Currently, Lisa serves as the Town Justice in the Town of Kinderhook, a position that she has held since first elected in 2010. Lisa has also previously served as an Assistant County Attorney for Columbia County responsible for prosecuting youth as persons in need of supervision and juvenile delinquency matters before the Family Court. During her career, Lisa has been involved with the Legal Aid Society of Northeastern New York and the Legal Project, offering pro bono representation. She represented victims of domestic violence, clients unable to afford representation in bankruptcy and family court proceedings and also volunteered in Legal Project clinics offering free legal assistance to indigent clients. Lisa currently serves on the Legal Aid Private Attorney Involvement Committee. In October, 2014, Lisa was honored by the New York State Bar Association for her pro bono service. Lisa M. Mills is a 1998 graduate of Albany Law School of Union University, and a 1993 graduate of the State University of New York at Oneonta. Lisa has been a member at various times of the American Bar Association, the New York State Bar Association, the Otsego, Delaware, Albany, and Columbia County Bar Associations as well as the Capital District Women’s Bar Association.